If you have suffered injuries in an accident involving a delivery van, delivery truck, or other large commercial vehicle, our hearts truly go out to you. Our experienced team is here to get the justice and compensation you deserve. We know that any serious auto accident is traumatic, but the damages and injuries increase substantially with these large and powerful vehicle. Many delivery companies also use fully loaded semi trucks (also called an 18-wheeler or big rig). These can extend up to 80 feet in length and weigh up to 40 tons. When they collide with other vehicles, injuries, extensive damage and even wrongful death is all too common. 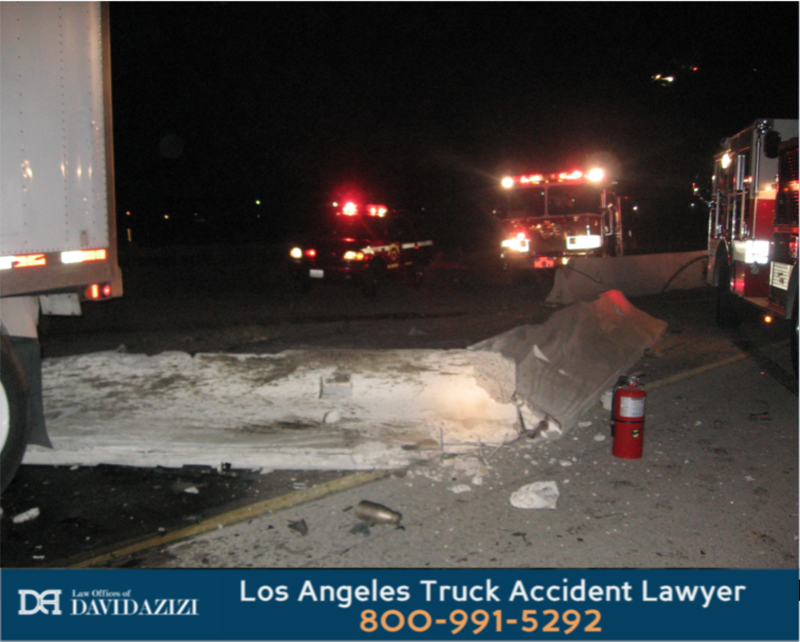 For 21 years, Los Angeles-area delivery van accident victims have found lawyer David Azizi to be exactly who they needed to represent them in truck crash cases. He has a 98 percent success rate in winning for clients financial compensation from the parties responsible for their injuries. If you need immediate assistance in the aftermath of an accident involving a delivery van, 18 wheeler truck, or other large commercial vehicle, please reach out day or night to the Law Offices of David Azizi by calling 800-991-5292. We will help you find the path forward with justice in this difficult time. What Is A Delivery Van? A delivery van (also called a delivery truck) is a larger category of cargo transport vehicles that covers both vans and trucks. Companies like Amazon and FedEx use both types of vehicles to deliver their goods to the companies and residences of California and the country. California delivery truck accidents can be devastating and the recovery process can cost victims not only severe injuries, but extensive loss of work, and an ongoing battle with pain and suffering. When you are a victim and your life has been dramatically harmed in a delivery van accident, you deserve to be made whole in the eyes of the law through justice and financial compensation, known in the the court system as damages. Driving a large delivery van in California requires additional training, a separate commercial driver’s license, and an expertise of how weight loading and distribution affects these vehicles and their cargo on the roads. In a recent motorcycle and ladder collision on the 405 freeway, what might have seemed like an insignificant object accidentally falling from a vehicle turned deadly. Drivers of passenger vehicles are responsible for properly securing any cargo they are carrying outside the vehicle. A ladder can cause perilous injuries and a mattress can fall victim to wind, tearing it off the roof, even with extra roping to secure it. When other drivers are injured and vehicles are damaged due to unsecured cargo, that driver has committed an act of negligence. Delivery vans, which often operate using a semi truck or big rig, can haul a much heavier and dangerous payload that includes large quantities of lumber, gasoline, and even toxic chemical freight. More than 100 people had to be evacuated in this Los Angeles big rig chemical spill to avoid the dangers of a highly flammable benzyl chloride cargo. Thankfully no one was injured in the incident. Flatbed trucks can be especially problematic in delivery van accidents because they are not secured within a container common to most big rig trucks and are more prone to losing their cargo. The standard of care for the driver of a delivery van or truck is even higher than standard passenger vehicles. In almost all circumstances, these drivers must master additional driving techniques through extensive training and must earn a commercial driver license (CDL) to operate a delivery van or truck. Of course, it is not simply enough for these drivers to hold the additional license. They have accepted a higher duty to put safety first. That means working closely with freight companies to guarantee all measures have been taken to secure delivery goods. When any steps are skipped, or if vehicle maintenance affecting securing systems is ignored, the accidents they cause require a stern response: a lawsuit suing for money damages. We will not let delivery van drivers and the companies that hire them get away with acts of negligence that affect all of us that share the roads. Drivers of delivery vans owe a higher duty of care to those they share Los Angeles freeways and California highways with. When they act negligently, we step in to right these wrongs. If you’ve lost the use of your vehicle, we can help. The delivery truck crash legal team David leads recognizes that accidents with these vans and commercial vehicles often leave a car undrivable. More times than not they will require extensive repairs, and in many cases we see, our clients will need a fresh start with a vehicle replacement. We recognize that sometimes personal property inside the vehicle can also be destroyed. The money damages we demand from the giant delivery companies always include the expensive resource of a personal vehicle. Our team steps in to determine the market value of your vehicle to begin the replacement process. Few of us in California can function without reliable transportation. Our clients will often require a rental vehicle, an added daily expense that can climb quickly. We fight to make sure these expenses are covered in the final amount we demand for you from the delivery drivers and the major corporations that represent them. If you’ve had to miss work as a result of your injuries after an accident with a delivery van, there is a positive path forward. The delivery truck accident claim we pursue for you includes lost wages. Even with our self-employed injured clients, California law allows the recovery of lost income when someone else acts negligently and fails to live up to those higher driver standards required of delivery van drivers. In the incident discussed in the video below, attorney David Azizi’s client’s SUV was hit from behind by a large 18 wheeler delivery truck. The accident was even more serious because the force of the delivery truck pushed the SUV into another semi truck in front of it, crushing the vehicle between the two tractor-trailers. Just like each accident we see, the settlements we win for clients are unique to each case. The delivery van crash injury calculator can give you an educated guess of what compensation for your claim might look like. The most accurate way to know what your case is worth is through a free case review. To discuss the specific details of your unique collision claim with David, call us 24/7 at 800-991-5292. We will connect you with David and he can begin your case evaluation. Knowing your next steps after an accident with a delivery truck or commercial van is crucial. 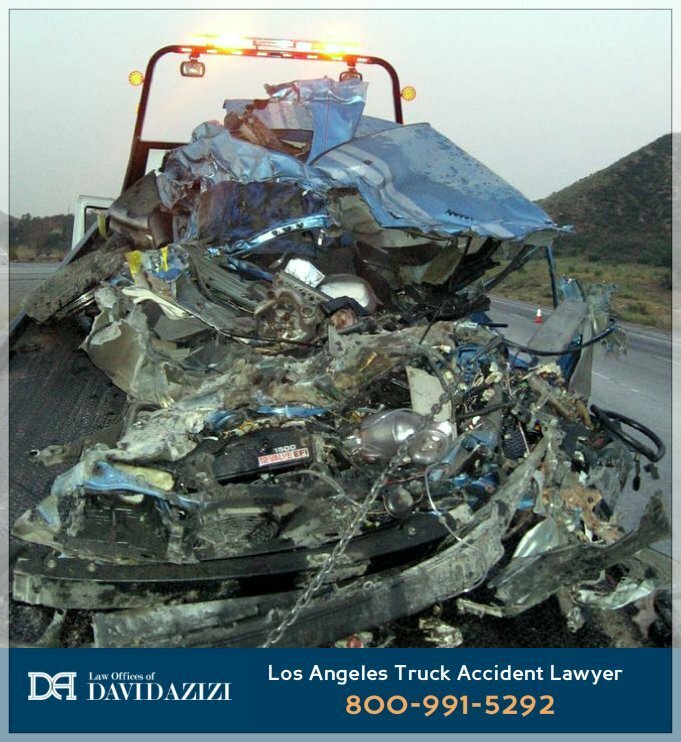 Los Angeles truck crash attorney David Azizi answers the most commonly submitted delivery truck crash questions in this podcast episode. Play the episode below. David’s extensive experience as a delivery truck accident attorney means he also knows what the evidence to demand from delivery companies. He will demand that they produce the log sheets that often demonstrate driver fatigue, and he subpoenas the data from EOBRs (Electronic On-board Recorders), made by Qualcomm and other companies. Similar to airplane “black boxes,” these give a record of driver and vehicle performance. Who Is At Fault After a Collision With A Delivery Truck? Determining fault after a crash with a large delivery van is an essential step in restoring justice when you have been wronged. In many cases we see, the driver and/or delivery company holds full responsibility for the accident and your injuries. When you’ve been in an accident and it’s not your fault, we will establish the driver’s liability and carefully determine the amount of money damages owed to you. California follows the guidelines of “Pure Comparative Negligence” where fault is concerned in delivery van accident cases. This means that when you are proven partly at fault, you can still have a “winning” case — your final award of compensation will simply be reduced by the percentage you were at fault. If you were hit by a delivery van or truck and the total damages awarded to you equal $1,000,000 but you were also 25 percent at fault, you’d receive $750,000 (the full award minus 25 percent for your partial fault). Bottom line, even if you think you played a major role in a crash with a delivery van, these cases can involve millions of dollars and still bring a significant financial recovery for your injuries and losses. Our delivery truck crash law firm takes very specific actions when we fight for your cause. Safety and medical care is always your top priority after an accident with a large delivery van. Our team can step in to help with hospital records and we will encourage you to attend each and every doctor visit. Not only is this physically important for you, but provides added legal protection so that the defense cannot suggest that you are skipping appointments and therefore your injuries are not really that significant. Filing a complaint with the court clerk – Submitting this document to the parties involved means we have officially opened your case with the California court system. The “complaint” we submit will highlight the evidence gathered, will outline your injuries, will make a claim that the delivery van driver is responsible for the crash and injuries (known as “liability”) and will provide your demand for justice and financial compensation (known as “damages”). Receiving an answer from the delivery driver & company – The “complaint” we file is our first move. The “answer” is the first move of the defense. It will undoubtedly to their insurance team and they could possibly admit their liability and move forward toward a settlement offer. Filing a Lawsuit Against the Delivery Company – Since these cases usually involved large amounts of money and resources, it’s very common for the delivery company to deny their liability and refuse to offer a settlement. When this happens, we are ready to file a lawsuit. That means we are headed to trial, where we will fight our case in front of a judge and jury who will ultimately reach a decision on the claims we’ve presented. In some cases, once a lawsuit is filed, the delivery van driver and company might decide to offer a settlement at that time. Our goal is to get you a fair settlement or verdict in the quickest time possible. If a settlement offer includes fair compensation, that ends our dispute and you get a financial recovery for the crash. If the offer is not fair, or if a settlement is not offered, we will fight your case all the way through trial until justice prevails. Choosing a delivery truck accident lawyer in Los Angeles can be difficult. We invite you to examine our track record. David Azizi wins cases at a 98-percent success rate. If we don’t win, you do not pay us for our services. That’s known as a contingency fee agreement, and if gives us the incentive to work very hard for you. Only in victory do we collect a percentage of what the delivery companies have paid out in money damages. Legal resource giant Avvo rated the Law Offices of David Azizi as “Superb,” and Expertise.com lists him on their Top 20 Personal Injury Lawyers in Los Angeles. Recently, the well-known ratings site “Super Lawyers” recognized David as a top L.A.-area attorney for the sixth time. One of the things that makes David so effective among delivery truck accident lawyers is his first hand knowledge of how insurance companies work. With deep roots in the insurance industry – the “dark side,” as David calls it – he learned how insures work to eliminate or reduce payments to injured victims. Knowing this, he is in a unique position to beat them at their own game and get you the deserved compensation they are looking to avoid paying. It’s so important for injured victims to understand that deadlines for filing a delivery truck lawsuit exist. This is known as the statute of limitations and you do not want to miss it. We urge you begin your efforts as soon as possible. David and team are ready to provide you with a free case review. This is your chance to tell us your story, how it happened and what you are going through. We will no doubt have questions for each other. Once we know the facts involved, we can build your case strategy and get started on your financial recovery. With each moment that passes after the crash, witnesses forget details or disappear, weather may eliminate evidence and stories may change. We urge you to avoid delay with something so important. Our offices are available to take or call or chat 24/7. Reach out to us at 800-991-5292 to begin your free evaluation. Married with three children, David takes each and every case very seriously. He knows families are dramatically affected and will not let delivery companies walk over you. He has fought for Los Angeles and California personal injury victims since 1998, and to this day continues to give his personal cell phone number to every client. If you are ready to begin your legal road to recovery, the Law Offices are ready to consider your unique and important case, and to become an advocate for your justice and your physical and financial recovery.